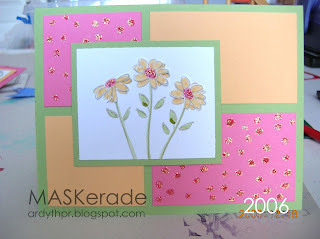 This card is for the very first Muse challenge - a new cardmaking club set up by the super-talented Jackie Rockwell. Use what you have in your stash, don't purchase anything new for your Muse cards . Vote for one of your fellow member's submissions that you find inspiring . Here's this week's Muse card, by the also-super-talented Amy Kolling. I focused on the floral image, the large, black sentiment and the side panels. 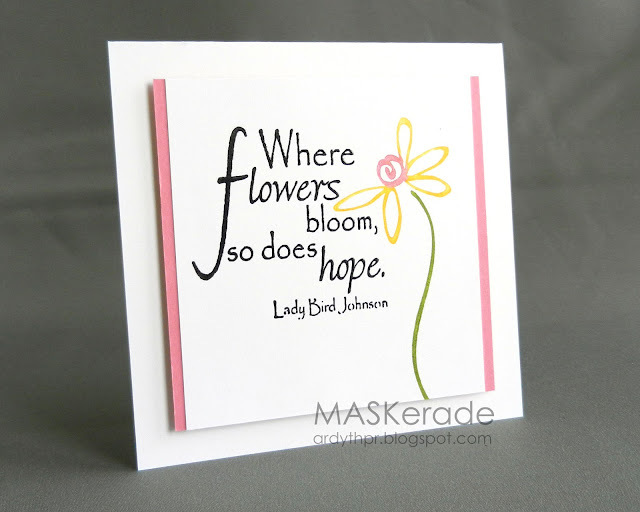 I used a Deadbeat Designs sentiment and Impression Obsession flower, inked with waterbased markers. Once you stop laughing , I hope you'll join in the fun! The link is just to the right! This is gorgeous, Ardyth! Love that flower image and the pops of pink on the side! Your card is beautiful Ardyth! I love that flower and the sentiment! Well, OK, that's a little better ... 'cause the first card you blogged about and CASEd was a pretty darn good card!! Love, love, love the line on your flower with the sentiment. Perfect placement!! O.K. I'm laughing but not about your card from a long time ago but about how you're telling us not to laugh! LOL! It's fun to see how our card making has changed over time. Your interpretation of Amy's card is a real CAS BEAUTY Ardyth! The simple lines of the flower are wonderful!!! Your cardmaking has indeed changed, but not in skill level. Now you're a trend-setter-artist and the stamp companies seem to be racing to catch up. We're so lucky you Blog because you probably could instead be working for some company that would pay you big bucks to do what you do here everyday. Fab card Ardyth, I would 't dare laugh at your first card as I just found my one! 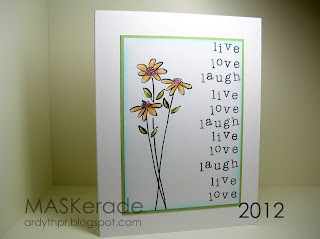 Eeek will be sharing my CASE of my blogged card. Not laughing -- I think we all look back at our early work which looked "so cool" at the time and shake our heads. 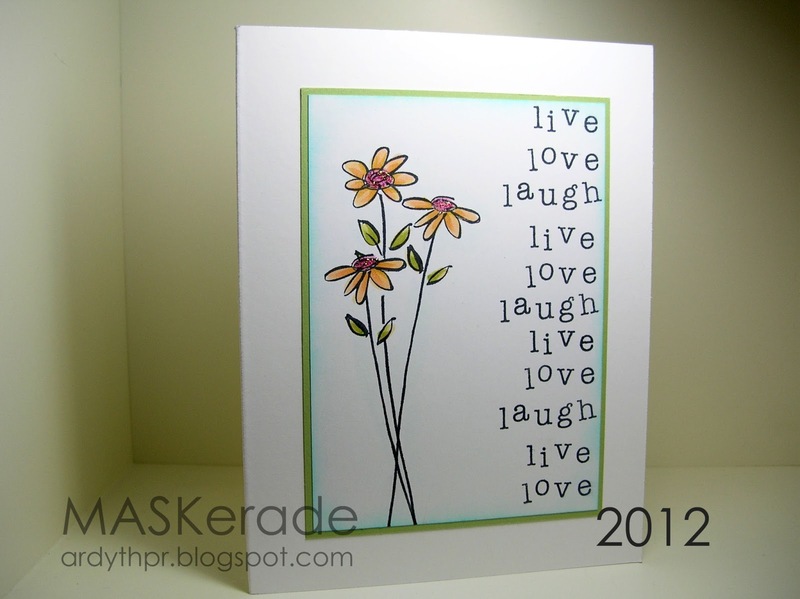 But I will say that I love how your style has evolved and this newest card is no exception. What a great card. I am off to splitcoast to see the first card I ever posted - I can't wait to see it! I wish my current attempts were as good as these first attempts! Beautiful cards and inspirations! Fabulous card! I spotted it over at the new MUSE challenge and was so excited to see it was by someone I know!!! It's a wonderful way to make me THINK of Spring instead of the bitter cold we have here today! Absolutely stunning Ardyth and such a wonderful interpretation of Amy's card! great card, love the CAS design and the gorgeous colours. I saw your do -over challenge on Lynn's site, looks fun and I am off to see what I did, gosh I hope I have got better! What a pretty card. Your flower is so delicate and whimsical, and I just love that sentiment. I love all of these, Ardyth! Even the first one you posted to SCS. I haven't dared go back to look at my first SCS card. Loving the pop of pink on your card. Great job with the Muse challenge. Ardyth, your post just makes me smile! I too look back at some of my cards and think really??? Your Muse card is a pure beauty. I like how the flower seems to just blend in with your sentiment. Gorgeous!! I got a little lost in all that, but it's not your fault, it's late here. All I know is, I think they are all great, even the very last one which you seem to be making fun of! Listen, compared to the first cards I made more than a decade ago, this looks like a masterpiece to me!! Love your CAS take on Amy's card and the sentiment is just perfect! I love the flower - it looks hand-drawn but watercoloured at the same time. And it goes so well with that sentiment. I'm off to join the MUSE fun (with hours to spare!). Oh man. I've got a blogoversary coming up and some cards photographed similar to yours (on my ironing board). That would be a riot to have a redo. FAB, FAB CAS CASE Ardyth - LOVE it! Love this one ~ the sentiment and flower go perfectly together. I really like how the flower petals fit almost inside the sentiment!